The challenge for the design team this month was a Spring card. I decided to check out what I had in my stash that I’d chosen for other projects, yet not used thus far. Almost everything on this card were waiting for a project, so I put them all together! This card is Fun, colorful and feels like “Spring” (as we’ve had a brutal winter). Check this out – there’s a card inside the flower pot. It’s pretty cool, right?! Thanks for stopping by – and feel free to leave a comment. So a group of ladies I worked with 15 years ago and I have been doing dinner every month or so for 15 years. We’ve been through a lot together. One of the ladies is moving far far away to start a new job. I was hoping a cheery card would make saying goodbye easier…. Wishing her luck in her new life & sad that she is leaving. I have enjoyed her friendship…and hope that we will stay in touch! 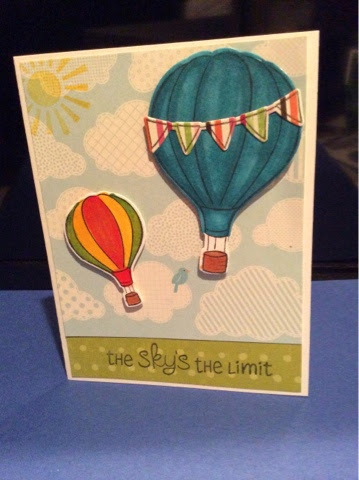 This card actually took no time at all (just about 10 mins) because I stamped the image 3 times, cut and colored and glued it all down. I used leftover paper from my Ariana Workshop on the Go . The stamp on the cover is from Stampin’ Up and the sentiment om the inside is from the Close to My Heart Art Philosophy Cricut Collection. Of course my Close to My Heart Exclusive Inks! did the trick. I think this is one of my favorites from Close to My Heart. Thanks for stopping by and visiting. Until next time…. For this challenge we we’re asked to make a Flower themed card.